The lavish lifestyle of Gu Junshan, a senior People's Liberation Army (PLA) officer who has reportedly been under investigation for corruption over the past two years, has been revealed by media amid the country's heavy-handed anti-graft fight. A senior officer in logistics, Gu is reported to have dozens of properties, from one of which a number of gold statues were confiscated. Analysts said the year 2014 will see an even harsher clampdown on graft, as President Xi Jinping Tuesday exhibited his resolve by stressing zero-tolerance for corruption. Gu, who held the rank of lieutenant general, stepped down from the post of vice director of the PLA General Logistics Department in February 2012. Speculation has since been triggered of an anti-corruption investigation into him. However, army authorities have yet to make a public announcement over his status. In an online interview last August, Gong Fangbin, a professor from the PLA's National Defense University confirmed the investigation into Gu, without revealing the details. An anti-graft expert, who asked to remain anonymous, told the Global Times Wednesday that there is grave corruption in the military especially in the logistics sector, but revelations on the military's graft fight is always kept off the radar for the sake of the military's image. News portal caixin.com recently gave the public a peek into the case by carrying a series of investigative reports on Gu and his family's lavish life and confiscation of his property in January 2013. The reports were based on interviews done early last year, but which were only published on Tuesday. "The case has aroused attention, so the [authority's] current tolerance for publicizing such an exposé could serve as an explanation to the public [of the case]," said the expert. According to the Caixin reports, Gu, who was once in charge of the military's infrastructure constructions, obtained huge economic interests by seeking kickbacks in the sale of land owned by the military. 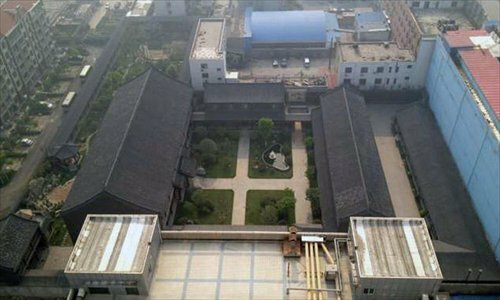 It was reported that Gu owns dozens of properties in Beijing, and Gu's brother, who set up plants to produce military supplies, had built seven villas for the Gu family in their hometown in Puyang, Henan Province. According to Caixin, Gu's compound in downtown Puyang, which occupies nearly a hectare of land, was built to imitate the Forbidden City and dubbed the "General's Residence." During a search of Gu's Puyang villa a year ago, a golden statue of Chairman Mao Zedong, a golden washbasin, a golden statue of ship and boxes of Moutai were confiscated by authorities, said the reports. Gu's alleged corruption prompted public attention toward graft in the country's military, which is considered a tricky issue due to the limited information from authorities. Ni Xing, a professor with the Center for Anti-Corruption Studies of Sun Yat-sen University, told the Global Times Wednesday that China's military is put under a major test due to the rising tension surrounding the country. "In order to shore up the public's confidence, the authorities should be more open and transparent in building a clean military," he said. Since December 2012, the Central Military Commission has issued a series of rules to curb irregularities, including an alcohol ban and strict rules for the use of military vehicles. The anti-graft drive in the military is in line with the country's vow to wage a long-term war against corruption. Addressing the third plenary session of the Communist Party of China (CPC) Central Commission for Discipline Inspection on Tuesday, Xi said the anti-graft fight needs long-term efforts. He also urged efforts to ensure "relatively independent and authoritative supervisory power" of disciplinary agencies at all levels. Ren Jianming, director of the Clean Governance Research and Education Center at Beihang University, told the Global Times that Xi has seized the key point in the anti-corruption fight. "The absence of independent and authoritative supervision would result in the inappropriate wielding of power, and the failure to constrain the practice of trading power for money," he said.